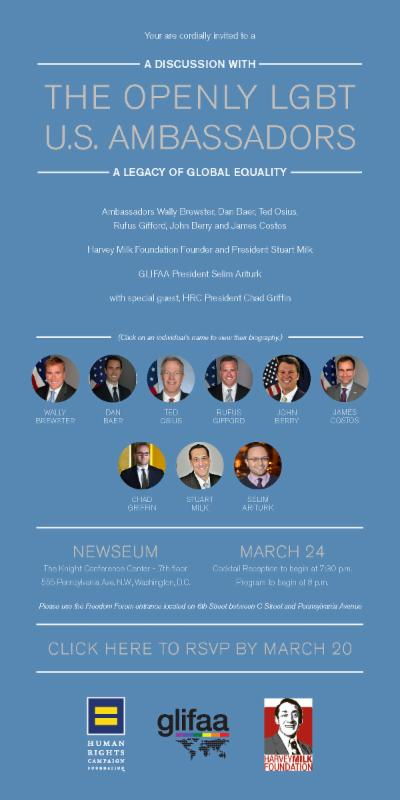 This is the ad for the event that took place this week at the Newseum. It was a gathering of all the openly gay U.S. Ambassadors. The ad says openly LGBT U.S. Ambassadors, but you might have noticed that is not what is pictured there. Participating in the panel discussion, which was hosted by the Human Rights Campaign, the Harvey Milk Foundation and GLIFAA (formerly Gays and Lesbians in Foreign Affairs Agencies and now LGBT+ in Foreign Affairs) were Ambassador to Australia John Berry, Ambassador to the Dominican Republic James Brewster, Ambassador to Denmark Rufus Gifford, Ambassador to the Organization for Security and Cooperation in Europe (OSCE) Daniel Baer, Ambassador to Spain James Costos and Ambassador to Vietnam Ted Osius (the only career ambassador). They are gay men and they are all white. Not even one of the moderators was a lesbian or person of color, to say nothing of transgender. LBT was not present in that picture or on that stage. Of course, it was definitely noticed in social media, where I was not the only one to notice that these representatives of the State Department are very pale and male. And it isn't just the Ambassadors. When the Department recently appointed an LGBT envoy, which to its credit is a career FSO (as is only one of the out gay Ambassadors), it appointed another white man. I was told at the time that there just aren't any lesbians or people of color who rank highly enough to be considered. And that seems to be true. I can find no lesbian or out person of color who has made it to the ranks of Senior Foreign Service. Of course, rank didn't stop the Department during Secretary Rice's tenure from appointing several men to the position of Deputy Assistant Secretary (DAS) who were only FS 02s in rank (for reference, FS 02 is the Foreign Service equivalent of a Lt. Colonel. Senior Foreign Service is the equivalent of a general. The highest ranking out lesbians that I know of in the Department are FS 01s, or Colonels, higher ranking than those men who were made DASes). And those men did not return to their mid-level positions afterward. In fact, two became Ambassadors, another an Assistant Secretary. But we don't even need to go there. Because it could be argued, quite rightly, that an officer should have more experience before being named to such high positions. But what about the political appointees? Five white men. Are you really telling me the Department could not find a single out lesbian or person of color for one of these positions? Anywhere? It stretches the bounds of credibility. I hope that someone in the Department will take notice the optics of how jarringly white that picture is, and how inappropriate it is given we strive for diversity and for a State Department that looks like America. As one person on Facebook said, this looks like the Supreme Court of the 1960s. I hope that the Secretary really meant when he said last year during his Pride remarks that " I’m working hard to ensure that by the end of my tenure, we will have lesbian, bisexual, and transgender ambassadors in our ranks as well." So we don't have much time left. So we got word yesterday that the White House has nominated Greg Delawie, the current Deputy Assistant Secretary for European Security, Technology and Implementation in the Bureau of Arms Control, Verification and Compliance (AVC), to serve as the next Ambassador to Kosovo. He will replace current Ambassador Tracey Ann Jacobson. I hear GREAT things about Ambassador-designate Delawie. He is a career FSO with tons of experience and according to some friends whose opinion I trust, is a smart, broad thinker with a great sense of humor. Like me, he is part of a tandem, and people LOVE his wife as well. According to his State Department bio, Ambassador-designate Delawie is "a senior Foreign Service officer with nearly 30 years of experience and is an expert in national security, diplomacy, and political-military affairs. From 2009 until 2012, when he assumed his duties in the AVC bureau, Mr. Delawie was Deputy Chief of Mission at the U.S. Embassy in Berlin, Germany, where he served as chief operating officer of one of the United States’ largest missions abroad. Prior to Berlin, he was Deputy Assistant Secretary in the Bureau of Political-Military Affairs, where he was the State Department’s lead on counter-piracy issues and managed programs regarding humanitarian demining, negotiation of status of forces agreements, and the State-Defense relationship. Mr. Delawie also served abroad as Deputy Chief of Mission at the U.S. Embassy in Zagreb, Croatia, and in various positions in Rome, Ankara, and Frankfurt. In other Washington assignments he worked on bilateral trade issues; human resources policy; aviation security; European regional affairs; and as a Watch Officer in the State Department Operations Center." Ambassador-designate Delawie speaks at least four foreign languages, including German, Italian, Croatian, and Turkish. I hope he will come study a bit of Albanian with us as well. I am really excited to have the opportunity to work with him when we get to Kosovo this summer. Let's hope for an easy confirmation!